A touching thing happened recently. While our COO, Terry Rose, was on his way to visit the employees at Wheatland Village, a photo message popped up on his cell phone, and he stopped in his tracks. When the time came in the employee meeting for Terry to speak he read this ad with pride and a catch in his voice. And when he looked up there was not a dry eye in the house. Our employees are in a wonderfully strange position. They adopt into our campus those who choose to make it home and those who’s care requires a supportive environment. Employees spend, in some cases, decades living and working surrounded by an extraordinary array of resident personalities and individuals. The way residents are a part of the lives of our staff and vice versa – that relationship comes to feel like family too. You could see and hear this in the silence of the room when Terry read the thank you. Our employees where moved by an expression of gratitude, and, what is more, that they were moved to hear that the work they do is seen as precious, honorable, and impactful. 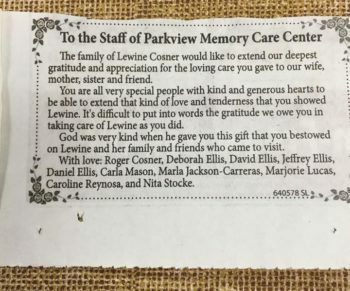 They were terribly touched and yet they already knew the impact they had had in Lewine’s life because they had lived side by side with her, celebrating living with her to the best of her ability, like family. To hear a thank you that turned a sad moment into a sweet one for the team – What a gift and what a beautiful sense of family.